Clary sage essential oil has a herbaceous, heavy, nutty aroma with a subtle fruit undertone. Clary sage oil is a strong, warming and relaxing oil which may be calming for nervous tension and head stress. When used on the skin, clary sage is useful for balancing oil secretions and for calming puffy skin. It has also been said to be useful for encouraging appropriate hair growth. As clary sage is a very relaxing oil, caution is advised whilst driving. Consumption of alcohol should also be avoided as it can exaggerate the effects of alcohol, and in excess it may cause headaches and nausea. Clary sage oil is distilled from the fresh flowering tops and leaves by steam distillation. Clary sage blends well with most oils, in particular lavender, citronella, grapefruit, geranium, sweet orange, frankincense and lemon. 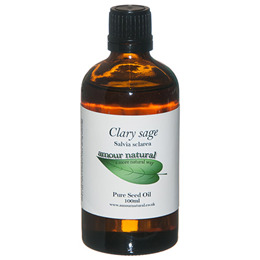 Clary Sage Pure Essential oil. Below are reviews of Amour Natural Clary Sage Pure Essential Oil - 100ml by bodykind customers. If you have tried this product we'd love to hear what you think so please leave a review.